There are many products that are either ‘must have’ or ‘should have’ or ‘better have’ in the world or 4WDing, camping and general life in the great outdoors. An air compressor is definitely one that fits into every category as it can have so many handy and convenient uses – aside from tyre inflation. Depending on your uses, there are a few things to look out for when purchasing an air compressor – maximum pressure, air flow rate, duty cycle, portability, accessories and of course price. Lets expand on a few of these points: maximum achievable pressure – no point purchasing a compressor that can only inflate low pressure toys like soccer balls, air beds and kids toys if your wanting to pump up your tyres to 40 or 50psi. For low pressure pumping that requires a large volume of air, all you need is a lower (maximum) pressure pump that has as high a flow rate as possible. Remember all those soccer balls, air beds and toys may have different openings, so be sure to look for varied fitments on the hose outlet. Without knowing a compressors internal technical specifications (or as we have lab tested on a Dyno), there is no way of guessing the flow rates. That will depend on the bore, stroke, RPM, internal design as well as other restricting factors like chuck type, air filter material, wiring gauge and length, as well as temperatures reached while running. Just because one compressor ‘seems’ to look identical to another, it may be very different inside – just like all car engines are NOT created equal, although many are rated at the same cubic size! Duty cycle; many people either forget, don’t worry or have no idea what or why it’s important to have a good duty cycle in a compressor. Roughly, the duty cycle of a pump can be thought of as the amount of time the pump is actually working when it’s turned on, compared to the amount of time it’s not working when it’s turned off – 2 minutes on followed by 2 minutes off is often (incorrectly) thought of as a 50 percent duty cycle, not very good when your hanging around trying to pump something up quickly! But then again, a (claimed) 50 percent duty cycle pump may run for 30 minutes, followed by a long 30 minute wait. Perhaps that’s okay to re-inflate your four tyres after leaving the beach – but will that pump actually do the job within 30 minutes – I’d hate to be waiting another 30 minutes, while the motor cools down, to finish that last tyre! Officially, Duty Cycle should be measured with the compressor pumping at 100psi at an ambient temperature of 22 degrees Celsius. The duty cycle is expressed in a percentage and is calculated by run time divided by the addition of the run time plus the off time, then multiplied by 100. As an example: if a compressor is rated at a 25 percent duty cycle, it can only (theoretically) run for 10 minutes followed by 30 minutes turned off. So, 10 / (10 + 30) multiplied by 100 = 25% duty cycle...not 33% as most would presume (10/30 multiplied by 100=33%). An internal thermal cut out switch which is primarily designed to protect the air compressors motor from burning out or over heating. You’ll have no control over this thermal cut off; when the unit heats to a pre set temperature, it (theoretically should) stops, leaving you twiddling your thumbs waiting for it to switch itself back on. A 100 percent duty cycle compressor, on the other hand is great for our 4WD tyres, as well as all your mates that line up to use your pump… ‘cause theirs keeps cutting out! Price – that’s the tough one. We all want to spend as little as possible, but want the best out of our gear. 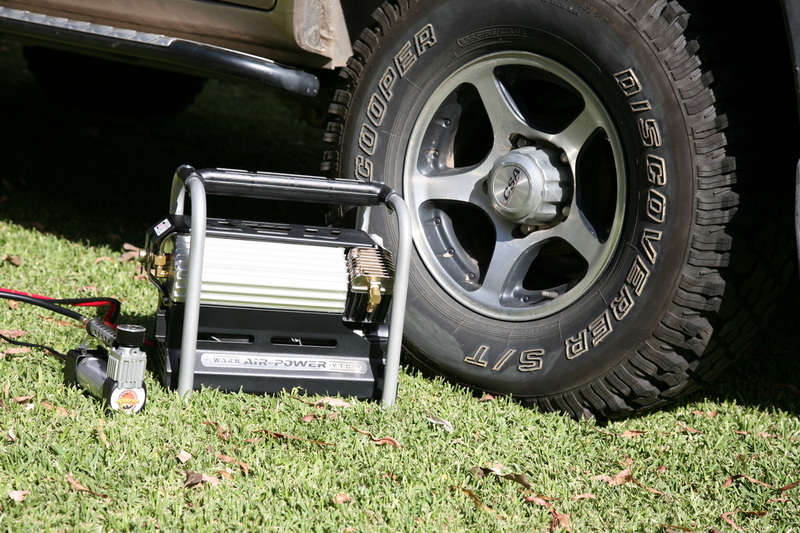 We’ve managed to round up most compressors on the market that are suitable for 4WD tyre inflation, as well as general use around the camp site. We've drawn a line at the units being portable; that is, they must be able to be carried and used from one vehicle to another – not engine mounted or engine driven. Of course, most of the compressors you see here can indeed be mounted in your engine bay, under your seats or in your cargo area, but they are all initially portable units. As we were keen to test all the air compressors both scientifically and in real life situations, we figured on hooking up with ARB’s state of the art Air Compressor Dyno and their design engineers Daniel Bongard and Sam Steward to measure all the technical issues of each and every compressor – maximum achievable pump pressures, motor temperatures, currant draw, air flow rates (standardised to 20 ºC at sea level) and whether or not the thermal cut offs worked. We ensured a constant 13.8 volts to simulate a vehicles electrical system with the engine running. To capture all these results, the test equipment automatically captures data while the compressors are pumping into a pressure vessel to a maximum of 130 psi. The internal and external temperatures of the vessel are known and kept constant, the time, the temperatures and every piece of data is recorded to ensure accuracy. Graphs are automatically derived from the captured results to provide a no-bull overall picture of how each compressor operates at any given pressure. All you need to do is run your finger along the graph lines to reach the pressure your operating at and you’ll see the currant draw and other relevant information – brilliant! After our two day stint in the dyno room, we hit the real world part of the test. Having fairly standard sized tyres for a touring 4WD on our own vehicle (285/75R16 inch on an 8 inch alloy rim) we figured on deflating a tyre to 0 psi and inflating it to 35psi – simulating pumping a tyre up after repairing a puncture. Then we deflated a tyre to 20 psi and returned the tyres pressure to 35psi - simulating returning your tyres to road going pressures after sand driving. SO WHO WINS OUTRIGHT HONOURS? Its’ a ‘horse-for-courses’ situation here; there is no one outright winner. If you’re looking for the most compact unit on the block, you can’t go past the tiny Terrain Taimer TTAC1 – it’d fit into most glove boxes, just don’t expect to inflate a large tyre from 0psi in one go! If all you want is maximum blow, the almighty Warn Air Power VTC is simply amazing; it’ll out blow all and sundry and have a line of mates a mile long who’ll want to be part of this amazing V twin compressor...perhaps you’ll need a few mates to help carry the thing too, as it’s bloody heavy and you’ll have to use all your mates batteries as it draws more amps than most alternators can produce; so much in fact that we couldn’t test it in the lab. Both the Big Red and the Blue Tongue, as well known for durability as they are, have superior duty cycles to allow long periods of use, albeit at a slower rate. These units don’t have all the fancy shiny bits hanging off them, but are worth their weight when it comes to purchasing for the long haul. I’d be putting an inline switch on the wiring of the Blue Tongue to make life easier, but the Big Red is better protected in a hard case and has a switch. Both need attention to the way their air lines are attached to the brass fittings – an easy job. Being a Thomas-built unit, the TJM Ox Air fits in similar to the Big Red and Blue Tongue – quality, slower than others, but in a soft bag. The air line connections needs work. Bushranger; geeze talk about offering a compressor for all occasions – there should be a unit to fit your wallet and needs amongst the six on offer, plus of course they can all be used in conjunction with their on-board air kits and air tanks – especially the Auto Max, which has an inbuilt pressure switch suitable for air tank use. Most Bushranger units have two stage foam/felt air cleaner elements with spares in the box. The Projecta range of three offers a hard case on two and the choice of single or twin head designs. Piranha offers the Max Volume, plus their version of the Big Red Thomas, which unfortunately was supplied as a hard mounted kit and couldn't be tested. We'd figure it’ll be similarly spec to the TJM version. A surprise package is the twin cylinder ABR Sidewinder; it’s well priced and blows third outright for the tyre inflation tests, had a high flow rate and is the only unit with a well concealed/protected air filter. The only Australian-built unit, the ARB Compressor, while physically small through its clever internal design, is of high quality both in the body and accessories material and construction. It’s obvious it’s been manufactured to suit Australian use, especially with its unique lab-tested sintered bronze air filter element (which is washable) that will keep out the finest dust particles. The complete body is water tight (testament to it being able to run under water with the air filter extended). Priced well and being in the top end of the tyre inflation test, along with impressive lab results makes this unit my number one pick for value for money for a compressor that’ll do what it claims, as well as offering unique, ingeniously designed components. Having an inbuilt pressure cut-off switch for running an air tank, plus the high-tech, heat-resistant hose and hard case (the lid actually switches the compressor off when closed as a safety feature) makes it the one to beat. The only thing we can’t test here is long term reliability, but having seen the internals of some cheaper priced units along side the quality ARB and Thomas units, I’m not sure I’d trust the El Cheapo to getting me out of trouble – even if it was only a once-a-year-use compressor. Once you've chosen your air compressor, don’t forget to use it. It’s no good not adjusting your tyre pressures to suit the occasion. It’s no good pulling out that air bed and sending yourself dizzy by giving it mouth-to-mouth, and it’s definitely no point having a you-beaut air compressor if you leave it at home – take it with you every trip away and you’ll be amazed at how often it’ll get used with inflation… regardless of the value of our Aussie dollar. The above tyre inflation times were all measured by us; each compressor was attached to a Toyota LandCruiser battery while the vehicle was running. We used a stop watch and figure on all times to be within applicable tolerances. The flow rates, motor temperatures and currant draw were measured in the ARB air compressor dyno room. See each dyno graph for a full compliment of figures. A long and tedious job indeed, but the only way to truly determine how each compressor actually works – no calculating, no guessing! While the lab part of the testing will not alter, the real life pressure times may change due to differing weather conditions and vehicle electrical system. Essentially, it’s the difference from one compressor to another you should be studying, as well as the outright times measured on this test to give you an idea on the unit that suits your needs…and pockets. MAKING A SLOW COMPRESSOR FASTER – CAN IT BE DONE? While we were testing each compressor in the lab, we figured on trying to speed up one of the units by replacing the chuck and air line, as well as the wiring loom. We replaced the Bushranger Pro Air long electrical wire, short air hose and over centre chuck with the ARB heavier gauge loom, higher flowing hose and chuck. Initially the Pro Air flow rate at 20psi was 27.6L/min and at 35psi was 24.2L/min. With the changes made we recorded at 20psi a flow rate of 30.5 L/min and 35psi we recorded 27.3 L/min. Small increases of close to 3L/min, which equates to over 10 percent better flow, which was replicated right up to the maximum pressures achieved. Thanks must go for the efforts of the engineering team at ARB for the lab testing part of this test. Daniel Bongard and Sam Steward put in the long hours, while I supervised (put my feet up in the back ground) the whole show to ensure fairness of results to all suppliers. Other than the already mentioned working attributes of the pump itself, consider a unit with an air filter if you’re thinking of using it in dusty or sandy conditions – which is pretty much all applications. Watch out for the positioning of the air cleaner – they can be easily broken when bumped as many of them are plastic and mounted via a small diameter plastic thread. Also consider how the unit is packaged; some that are in soft bags allow the vulnerable air cleaner to be knocked (and broken) while in transit, so a hard case could be desirable to protect your assets. A sand (or base) plate, with anti-vibration (or vibration absorbing) feet is handy if you have to remove the air compressor from a bag to use. An inbuilt air pressure gauge may be useful, but be sure they are accurate - we found most weren’t. Connections: alligator clips for battery terminals – are they large enough to actually fit onto your terminals? Wiring: is it large enough gauge to allow adequate currant to run the pump to its maximum potential? Chuck: does it quickly and easily fit to your tyres valve and does it allow unrestricted flow? Do these connections get too hot to handle with bare hands after extended use? We found that even the compressors with insulated air line fittings get too hot to touch – throw a pair of gloves into your kit for safeties sake and don’t let the kids handle the pump after use as they will burn bare skin! Is the complete compressor sealed for dust and perhaps water – especially if you plan hard mounting the kit. To aid in the job of airing down to simulate sand driving we used a set of Staun tyre deflators, preset to 20psi. We then checked the tyre each time with a high quality tyre gauge. These Staun deflators are said to be accurate to 0.25psi and we found in our pressure checking to be spot on, saving us plenty of time and back ache while airing down the tyres so many times. See www.staun.com.au for more info. To air down to 0 psi, we used an ARB E-Z Deflator, which removes and retains the tyre valve, allowing all air to escape from the tyre, then reinserts the valve – quick and easy to get down to 0psi as fast as possible, saving us plenty of time. See www.arb.com.au for more info. Each driver, that’s YOU, must be aware at all times, the pressures your tyres are running – whether on road or off. With an air compressor in your kit, there is no reason for not adjusting pressures were necessary. For those that may have trouble remembering to check tyres regularly, there are a number of tyre monitoring systems available, complete with sensors on each wheel and digital readouts in-car. If the sensor alarms go off, do something about it immediately to save on expensive tyre damage – after all that’s one of the reasons why you purchased an air compressor…isn’t it? Compressed air produces heat; there’s no two ways about it, all these air compressors will get hot during use. There are two alternate ways each of these units’ attempts to keep their cool. Most rely on metal fins on the head, or other parts of the compressor motor or body to dissipate heat – a heat sink. The other compressors rely on an internal fan blowing air over the motor to help keep it cool. One method is not necessarily better than the other, but the point to note is the cooler an air compressor is kept, the better (longer and faster) it will operate – heat kills electrical and mechanical systems! If you do deicide to hard mount any air compressor (under your seat, in the engine bay or cargo area) try to provide as much flow through ventilation as possible while using the compressor. A fan cooled compressor can’t be sealed (it must have slots to allow the cooling air to flow through) so is not ideal for mounting or using in dirty or more importantly, wet environments as the water will spray over the 12 volt motor, quickly starting the corrosion process. But what about ‘regulation’, what about ‘fair advertising’ – ha...you’ve gotta be kidding, none of that exists in the world of flogging air compressors to the unwary! Unfortunately, we found many discrepancies in what was printed on the packaging or instructions, compared with figures we actually measured in this test. Let’s start with the flow rates of “insert whatever damn figure you want…and then double it to look impressive” L/min that manufacturers quote: not many even come close to nominated figures, with many achieving half that quoted and some 100 L/min less than quoted – try 50L/min instead of 150 L/min…perhaps a typo in their paper work…but I doubt it! For the clever Dicks that figured a twin head unit flows twice that of a single head of the same design – go back to engineering school, it doesn’t work like that; just like adding four more cylinders to your 4-pot car doesn’t make it go twice as fast! Then there’s the maximum psi each unit is supposedly capable of blowing – what a joke that is, with many cutting out well short…oh that’s right, there’s a thermal cut out switch to supposedly protect the motor…so why quote ridiculously high maximum figures? Oh and don’t forget currant draw: many quote draw at 0psi, which is stuff all use when we operate the compressor at higher psi and low and behold, we see currant draw figures double that quoted. Just because the packaging says “suitable for inflating 4WD tyres”, I’m afraid it just ain’t so in many cases. Have a good look at all the graphs of each compressor and see for yourself. While at the ARB lab, we had their engineers pull apart a few compressors (not those on test) with some astonishing findings. How about plastic pistons in a compressor that generates a lot of heat...enough to actually melt the piston – not good enough sorry! Thermal cut out’s – yeah right, one El Cheapo unit had no sign of any electrical or mechanical cut-out circuitry…or did they mean it cuts out when it disintegrates…sorry my fault for not understanding! Umm…using cardboard from the packaging boxes to act as a gasket between the head and body of the motor…you’re kidding…aren’t you? ‘Fraid not, the foreign instructions on the cardboard ‘gasket’ could be clearly read – provided you were multi lingual. Have a close look at a few of the air cleaners; some do an excellent job at keeping giant clods of mud the size of camels balls out of the mechanicals, but would fail dismally at keeping dust, let along bull dust out. Only one filter is lab tested to 30 micron to ensure bulldust stays out – that’s the sintered ARB unit, most others are of dubious quality. The copper coil, that forms the 12 volt motor, can be copper wound around a drum, or it can be wound properly with ends tightly secured with appropriate methods – some of the internals we saw were horrifyingly wrong! At the end of the day, it’s a gamble for most, but sticking with reputable brands will go a long way to seeing you purchase quality not crap.